The XH-17 began as a ground test stand for a huge tip-jet-powered rotor system. In 1949, Hughes Aircraft got a contract to turn it into a flying machine. 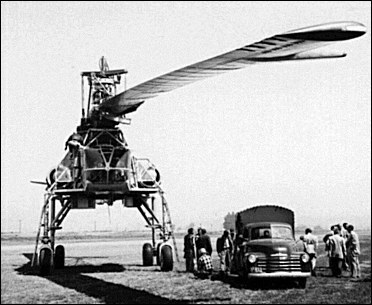 The giant rotors promised a huge lifting capacity, so they were attached to stilt-like legs and a box-like fuselage. Cargo such as radar vans could be driven underneath and lifted away. It was proposed that tanks could be carried this way, but as an operational aircraft the XH-17 was just too bulky and cumbersome to be practical and had a range of only 64km, well below the US Army's requirement. 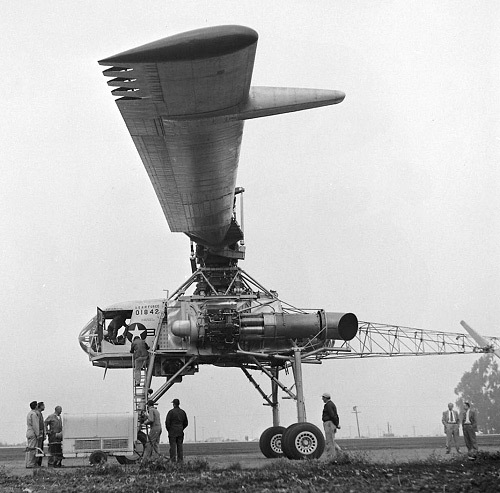 The rotor blades were subject to vibration stresses and the XH-17 was frequently grounded. After three years of sporadic testing, the whole programme came to an end when the one set of rotors reached the end of its design life. 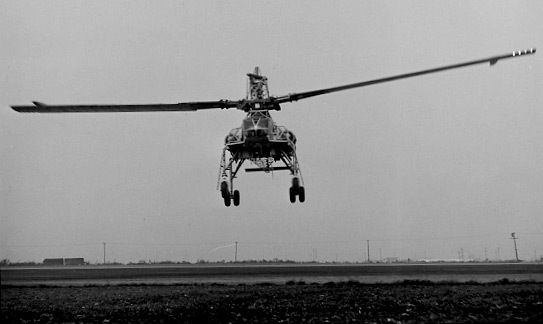 By letter dated 31 January, 1946, Materiel Command requested qualified manufacturers to submit proposals for the development of a large experimental helicopter. This rotary-wing craft was to be capable of carrying externally an 2.44m by 2.44m by 6.10m cargo package weighing up to 4536kg at a top speed of 105km/h, to hover at an altitude of 915m, and to have a tactical radius of 160km and an endurance of 30 minutes. It was intended for use in transfer of ordnance, equipment, supplies, and personnel, with loads to be lowered into or lifted out of areas in which even helicopter landings were impossible. Moreover, this sky crane helicopter had to be easily dismantled for transport on standard trailer trucks. 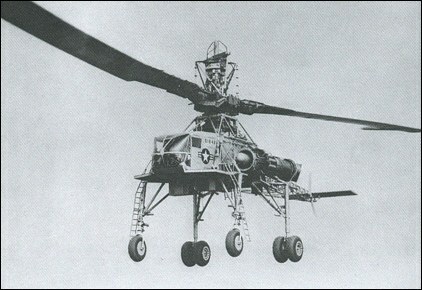 Advised by Friedrich von Dobhloff, the Austrian engineer who during the war had pioneered the application of jet principle to helicopters at the Wiener Neustadter Flugzeugwerke and who also worked with McDonnell on the XH-20 and other helicopters, the AAF Rotary Wing Branch recognized that achieving such capabilities would require major and risk-fraught technological advances and, accordingly, it encouraged bidders to consider using (1) a method of rotor construction other than conventional steel tube spar and wood; (2) gas-turbines and jet-driven rotors; and (3) servo controls, blade ailerons, or other devices to reduce the high control forces inherent in the use of a main rotor which was expected to have a diameter of 22.86 to 24.38m. Finally, to minimize costs, the Rotary Wing Branch recommended that the fuselage and other non-critical components of this flying test-rig be constructed in the simplest form possible. As requested, the bidders submitted proposals for a two-phase programme with the first phase consisting of a design study and the second phase, which would be undertaken only after the AAF approved the design study, calling for the fabrication of a flying test-rig. After proposals evaluation, Kellett Aircraft Corporation of Upper Darby, Pennsylvania, was notified on 2 May, 1946, that it had won the design competition and soon after a contract for the first phase design study was negotiated. The one-year design study phase revealed that technical problems would be even more difficult than anticipated, notably as the result of the need to use a rotor of much greater diameter, and hence more difficult to manufacture and control. Powerplant selection also proved arduous as, although concurring with AAF personnel at Wright Field that the use of gas-turbine and rotor-tip combustion was likely to provide the best solution, Kellett was eventually forced to recommend a twin-turbine installation instead of the single turbine favoured by the AAF. This and other technical recommendations were endorsed by the Air Materiel Command at the end of the design study phase and on 27 August, 1947, Kellett was awarded Contract AC15011 to build a ground test-rig for the XR-17 (which became the XH-17 in June 1948 when the newly created USAF adopted a revised designation system). Provision was incorporated in the contract for the modification of the ground rig into a flying test-stand at the Air Force option. While the XH-17 ground test-rig was under construction, Kellett ran into financial difficulties and in 1948 sold the rights and partially completed rig to Hughes for $250,000. Pleased that work on the largest helicopter then under development would be continued, the USAF approved the transfer of the partially completed rig from Upper Darby to Culver City. At that time, key members of the Kellett design team were hired by Hughes and moved to California where work was resumed quickly and the test-rig completed in late 1949. 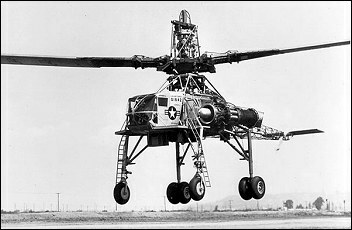 To save costs, as had been recommended in the request for proposals and provided in the Kellett design, Hughes incorporated components from other aircraft in the XH-17 test-rig. The two-seat cockpit came from a Waco CG-15, the single-wheel front undercarriage from a North American B-25, the twin-wheel main undercarriage from a Douglas C-54, and the 2407-litre fuel cell from a Boeing B-29 bomb bay tank. Power was provided by two General Electric 7E-TG-180-XR-17A gas generators (modified J35 turbojets) with bleed air from the intermediate compressor stage being fed into the rotor hub and then through ducts to four tip burners at each blade tip, where fuel was added and burned. This dual powerplant installation was predicted to provide the equivalent of 3480hp when the rotor turned at its normal rate of 88 rpm. The 39.62-m diameter two-blade rotor relied on tension-torsion straps for blade retention. Ground running began on 22 December, 1949, and, as was expected from such a drastic advance in rotary wing size and complexity, soon brought to light a number of teething problems. Nevertheless, satisfactory progress was made until June 1950 when a cyclic gear failed, badly damaging the rig. Eight months earlier, however, Hughes and the Air Force had felt sufficiently confident in the project to proceed to the next phase and the manufacturer was funded under Contract AF8907 awarded in October 1949 to modify the ground rig into a flying test-stand. Hence, instead of merely repairing the rig after the June 1950 accident, Hughes also incorporated changes required to prepare the XH-17 for flight. Notably, these pre-flight modifications included the fitting of a dual hydraulic system, each featuring three variable displacement hydraulic pumps, and the installation of a tail rotor. 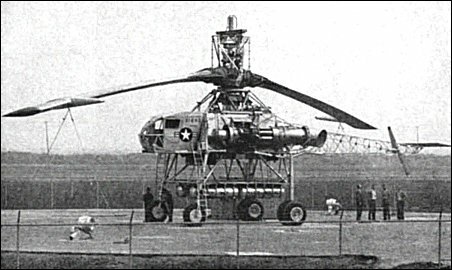 Due to the absence of driving torque resulting from the use of a pressure-jet cycle system to drive the main rotor, the diameter of the tail rotor could be reduced in comparison with that which would have been required for a conventionally-powered helicopter with the overall size of the XH-17, and for yaw control Hughes was able to use the tail rotor of a Sikorsky H-19 mounted on a tubular fuselage extension. Ground testing resumed after a two-year hiatus during which these modifications were incorporated at a leisurely pace while design of the servo control was being refined. Finally, having received the Air Force serial 50-1842, the XH-17 was first flown by Gale Moore at Culver City on 23 October, 1952. That flight, however, had to be cut short after the XH-17 had been airborne for barely a minute as directional control forces were excessive. While correction of this deficiency could be made quickly, difficulties uncovered later in the trials required more time. In particular, high vibratory stresses in the main rotor blades were difficult to correct and the XH-17 was repeatedly grounded while modifications were incorporated. The off and on test programme ended when the rotor blades reached their design life in December 1955. All in all, the XH-17 had validated the design concept and its development into a satisfactory sky crane would have been feasible had it not been for the high fuel consumption rate which could not be reduced to any significant extent and which precluded ever achieving the 160-km tactical radius requirement set back in 1946. On the positive side, this large sky crane helicopter possessed several remarkable assets, including its demonstrated ability to airlift a standard Air Force remote communication trailer and loads of up to 4665kg. It was indeed ahead of its time in many respects apart from its obvious size. Pilots notably praised its exceptional responsiveness to collective and cyclic pitch control movements and the negligible level of vibration felt in the cockpit. Conversely, they complained about the sluggishness of its directional control. I posted a short newsreel clip on Youtube that has footage of this craft in it. nice article you got here! Long shot, does anyone know where I can obtain a DVD of a 1980s doco called "The Chopper"? I have no idea who produced it, exact year, or who the English-sounding narrator is. It includes interviews with Hanna Reitsch and Bart Kelley (coworker of Arthur Young at Bell), and other techs and pilots, as well as footage of the prototype NOTAR, Apache, Sikorsky ABC and the XV-15 as well as the XH-17. Hi: nice site and history of XH-17 Crane. Although I wrtie about avaition and space projects of the Cold War, I'd like to locate some photos of the XH-17. Anybod have such for trade or sale? Also, any Hughes space projects such as Lockheed/Hughes folding wing ferry space plane. Thanks and have a goo day. Sorry Chuck, you must have seen a different ship. The XH17 never left it testing grounds at Hughes and never flew higher then 700 feet. 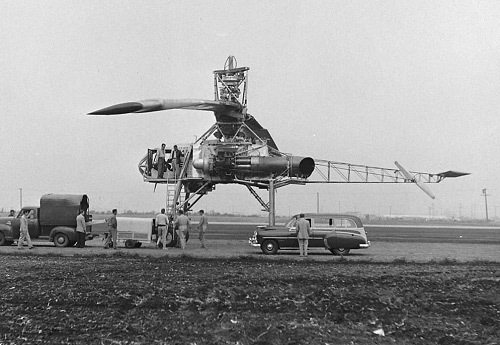 Also, by 1967 I'm pretty sure the XH17 had be dismantled for parts. It was one of a kind and Hughes did not try to improve on the prototype. The concept drawing I mentioned may have been of the HX-28. I worked for Hughs Aircraft, at Culver City and my office was in the World's Largest all-wood Building," where the Hughes Tool Co. designed and built their helicopters. I've watched the XH-17 fly up and down, over the runway and seen it lift some huge, heavy objects with apparent ease. My most striking memory is of slow rotation of the rotors and the "whop whop" sound they made. I also say a concept drawing portraying a modified XH-17 flying over an inbound airliner, matching speeed and direction and attaching the airliner with a grappeling device. The airliner was then shown to power off while the XH-17 flew over downtown Los Angeles and landing the airliner straight down onto a small landing pad. I grew up in Culver City and actually saw this craft fly. One day when I was in school it flew over Jefferson Blvd. and landed in the bean field across the highway. It got stuck in the mud and had to be towed out. I aways thought this was the coolest helicopter I'd ever seen. If anyone is interested in the development and testing history of the XH-17, Gale Moore the original test pilot is still with us. Gale is friend of mine and lives just down the street. Gale is getting on in years but is still active and has written down his history with this air craft and his time working for Howard Hughes. hello i teach ch54b class on structure and basic knolage of sikorskys design. i would more info about the xh-17 i grew an intress when known kowlage that sikorsky idea and cocept of there crane came from hughes crane thanks alote for your time wes. � To save money, parts of other aircraft were used. The cockpit came from a Waco CG-15 glider, the front wheels from B-25 bombers, the dual main wheels from C-54 transports, and the fuel tank was originally from a B-29. � Entry to the cockpit required a pair of tall ladders attached to the forward landing gear legs. � The rotor system was powered by gas jets generated by a pair of modified J35 turbojets mounted on either side of the fuselage. � The tip-jet system almost eliminated torque, but a tail rotor from an H-34 was mounted on an extension to help witli directional control, which was judged to be poor.